Do Realtors Have To Tell You That A House Is Haunted? Buying a house is one of the biggest purchases you will make in your life. When you're spending hundreds of thousands of your hard-earned money on something you're going to be stuck with for years, you definitely want to make sure that it up to par. However, sometimes the unappealing aspects of the house don't jump at you until after you've moved in, and this is why many buyers are protected by the law. In many states, realtors are legally obligated to inform a potential buyer of serious issues and defects that are present in the house, like a leaky roof, pests, mold, and flooding. But there's one much debated issue that real estate agencies and the law are still divided on: paranormal activity. Home buyers often wonder if a realtor has to disclose whether or not a house is haunted. So what's the deal? Houses that are supposedly haunted houses are considered "stigmatized," according to Curbed.com. This is an official designation for properties that don't have visible physical defects, but would trigger an emotional response and scare off buyers. Houses where murders, suicides, and certain criminal activities have occurred also fall under this classification. Of course, these are important details that every buyer would want to know, but since the topic is so subjective, the laws vary by state. In California, realtors must inform buyers of any deaths that have occurred on the property in the past three years, while New York State sellers have to adhere to the "Ghostbusters ruling," which states that relators must disclose to buyers that a house may be haunted if they have already mentioned it "to the public at large." This came into effect after the 1991 case of Stambovsky v. Ackley. Arizona state laws oblige sellers to share "all known material facts," including hauntings, but in other parts of the country, like Massachusetts, realtors are under no obligation to let a buyer know that a house might give them the heebie jeebies unless they ask about the house's paranormal history. "There truly is no disclosure too big or too small or too silly." Still, experts encourage sellers to always be upfront even if they think it won't help them close the sale. Not only is it ethical to do so, this will also protect realtors from lawsuits and financial woes in the future. "When you think of paranormal activity, you don’t think of home disclosures, but you should,” says Sam Pawlitzki, a California-based real estate agent. “If you think your house is haunted, or if you’ve had an exorcism done, you should disclose the info to the buyer side. There truly is no disclosure too big or too small or too silly." Despite the warnings, realtors who aren't bound by any legal rulings will most likely avoid revealing a property's creepy past because nearly half of home buyers won't even consider a house that's believed to be haunted. Lucky for those who do believe in the paranormal, you won't have to always depend on someone else to tell you if you'd be sharing your new home with ghosts. Since ghosts are believed to be the spirits of people who once lived and/or died in the house, websites like DiedInHouse.com can help you figure out what took place in a house before you make the big decision. 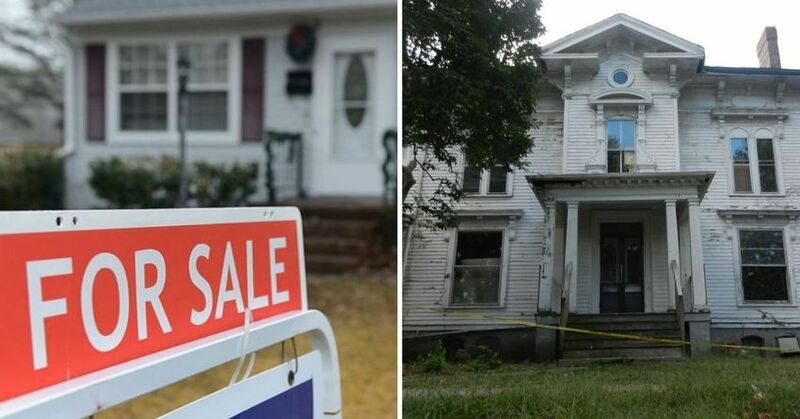 Would you purchase a house that's supposedly haunted?